The upcoming May 11, 2015 election is being widely viewed by analysts and citizens alike as a pivotal election for Guyana as a fledgling democracy. Elections are a time of heightened citizen engagement within a formal decision-making process. As such citizens are routinely bombarded with messages and information to influence their selection of a representative. According to the Preliminary List of Electors (PLE) there are 567,125 citizens faced with this decision, some of whom will be voting for the very first time. 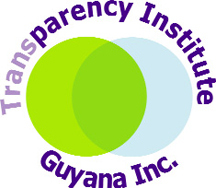 Guyana urgently needs campaign finance legislation, which would aid in ensuring a fair and level playing field for all political parties and help citizens and civil society to monitor the actions of political parties. 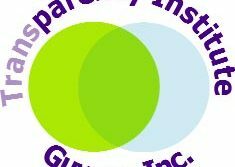 Guyanese ought to know where the money and resources that finance political party campaigns come from. This is not only to ensure that state and other resources are not abused, but also to ensure that the public is aware of which interests the government may be favourable to in the post-election period. For example, if the public is aware that a particular businessman is a significant financial contributor to a particular party’s campaign, the public can be vigilant in ensuring that the business in not given any special favours in the new government. Knowing where money is coming from to finance the campaigns of political parties deters corruption, as money is less likely to be used improperly such as the use of state resources (public money, vehicles, staff etc). This would also prevent the misuse of state assets, ensuring for example that state-funded radio, television and newspapers are fairly accessed by all political parties. Campaign financing laws may also set limits on how much a particular individual or entity can contribute and allow for monitoring when those limits are violated. TIGI is currently distributing posters throughout Guyana to raise awareness on how corruption affects the ability of citizens to access basic services and claim their human rights in areas such as access to water, education, justice, the environment and governance. Democracy requires that citizens are afforded the ability to elect (to hire and fire) their leaders. 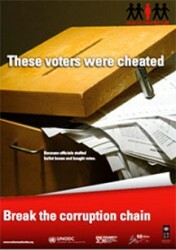 This process is stymied in instances where corrupt practices such as buying votes and rigging elections take place. 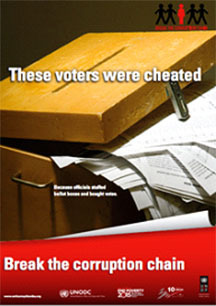 Posters are available at the TIGI office, for more information on the UN’s “Break the Corruption Chain” agenda, visit http://www.anticorruptionday.org or the TIGI website/Facebook page. 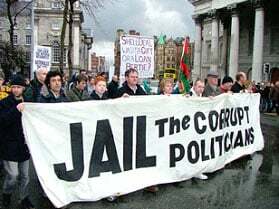 Within Latin America, as in other parts of the world, citizens are demanding that corrupt politicians be held to account. The theft and misuse of public funds is illegal under Guyana’s laws; public officials who are guilty of corruption must be held to account. ‘Impunity’ means an exemption from punishment; committing a crime but facing no consequences. In recent months, both major political parties have made statements on corruption especially in the light of a continued and sustained chronicle of incidents, weakened or non-existent institutions and processes, which continue to allow for the amassing of dirty money. Corruption is an important issue that needs to be placed on the agenda of any new government since it materially impacts on Guyana’s ability to develop and eradicate poverty. Any public servants, including ministers or other senior officials who have been found to have stolen money from the Guyanese public should be dealt with under the law and made to face the consequences if convicted. As a nation, irrespective of which party is in power, what is the message that we should send to our government on corruption? Should stolen money be written off, or gifted to the public official? Or should legal efforts, both locally and internationally, be made to bring corrupt officials before the courts and recover public funds and assets? 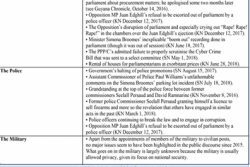 At present no one is aware of whether funds have been stolen or how much money is in question because there has never been an investigation of a senior public official in Guyana. Recent global examples show the staggering amounts of money that are at stake. In 2015, Sri Lanka has begun to recover funds estimated at US$2 billion misappropriated under the Rajapaksa administration. Legal recourse does not only apply to corrupt holders of office but also by their family, friends and associates. Nguema Obiang, the son of the president of the impoverished Equatorial New Guinea, paid US$1.1 million for a crystal-studded Michael Jackson glove and Karim Wade, the son of Senegal’s President was sentenced to six years in prison for corruption. In Guyana there has been no similar example of corrupt public officials or their associates, relatives or children being held to account. These systemic failures highlight the necessity for other critical reforms including of the legal system, as accountability requires strengthening and safeguarding the independence of the judiciary and monitoring how corruption cases are being heard and judged.